Sometimes it takes extra time to give your curls that professional look you strive for when you are on the job. A beautiful set of curls can really compliment any savvy business look as long as you make sure your hair is as frizz free! So what would make curls “unprofessional’ One thing that I would say is that it is absolutely unprofessional to go into work with wet curls. Make sure you either wash your hair the night before the job or use your DeveFuser in the morning to make sure your curls are nice, bouncy, and not wet. A good way to give your hair a professional look is to grab a pretty hair ornament that matches your outfit for the day. Silver or pearls are always a classic. Play around with what seems to look professional to you. Who knows maybe your co-workers will be dying to know what kind of gel you use to make your curls so perfect (and hopefully…you tell them DevaCurl). My tip to all the curly girls out there is embrace your curls! Frizz-Free Curls always looks professional no matter what style you decide to wear your hair in. If you are trying to grow your hair long you may be dreading getting your hair trimmed. But you should keep in mind that it is important to go for a quick trim sometimes, so your curly hair remains nice and healthy and your curls can eventually be long, gorgeous locks. What are signs of hair that needs a cut? Well, the most important sign to look out for is split ends. Take a look at the ends of your hair. Does one hair split into two at the bottom? If it does you should know that the elasticity of your hair is growing weak. It is time to run in for a trim! Have you 'colored or tinted' your hair tons of times or used products that you realized were no-no’s for a curly girl? Your hair just may be damaged. Curly hair is extra dry, way more dry than straight hair. 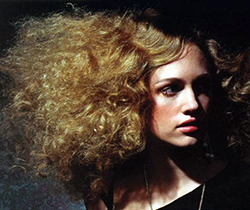 If you have straightened your hair tons of times then your hair may be damaged from the heat. Damaged hair may be brittle or hard, even crunchy. If your hair is damaged you NEED a cut pronto. Sometimes you might notice that your curls have lost their normal shape. Your hair may be weighing itself down. If this is the case it may be a good idea to get a trim with some layers; that way your hair can get back to its normal self. Sometimes it takes a lot out of us to keep our curls in tip top shape. Curly hair is naturally a bit more dry than other types of hair. Here are a few of my favorite tips for curly girls who are not willing to spend over fifteen minutes a day on their hair. I know sometimes I am a roll out of bed type of curly girl, who… (gasp) may start my day without looking in the mirror. Here are some tips on how to go low maintenance while still keeping your tendrils beautiful. Style your hair in the shower: Next time you jump in the shower make sure to bring your gel in with you. And if you use DevaCurl AnGel, all the better. Once you have finished showering make sure you stay in the shower and apply a large amount of product to your hair. Make sure to get all areas of your hair nicely gelled. This is a great way for your hair to keep hydrated by locking in extra moisture. Put it in an up do: You all know the drill, put your hair in a nice bun..or as the french call it, a Chignon. This is one of the easiest ways to have a no fuss morning. Smooth it out a bit with some gel. This up-do is as easy as one-two-three. Try an experiment: Take a quick shower, comb out your hair and leave the house with your curls natural. When was the last time you did this? It may not be your best hair day but it is a good test to see what your natural curl is. Knowing what your hair is like without any product or styling can help you find ways to make the best of your curls on a day when you're feeling low maintenance OR help you figure out what your problem areas are and what you need to fix for a day when you are looking to be the sexiest curly haired girl in the room. The Messy Bun: Curly hair looks amazing in a messy bun. Now we’re not talking too messy, but what I would like to call “trendy” messy. For a messy bun make sure your hair is dry and put some shine serum throughout your hair. Since your hair is in a bun you don’t need to be too concerned with smoothness. Once your hair feels smooth enough, gather your hair into a loose bun and let some tendrils peak out and perhaps frame your face. This gives this classic chignon a boho feel. The Classic Ponytail: The ponytail is probably the easiest hairstyle for curly girls. Even though it is simple, a ponytail lets everyone see your beautiful long curls. Gather your hair, and you know the drill…put it in a ponytail. In order to make it classic make sure to smooth out all protruding hairs. And if you have longer bangs make sure you rock them with this up-do. Try using the DevaCurl styling gel in order to smooth out any inconsistencies. The Half Up: This princess-like hairstyle is simple, easy, and no fuss. Just simply style your hair as you normally would when you leave it down a-la-natural. Take the hairs that frame your face and create a flowing ponytail against your head of curls. This style is great because it keeps hair out of your face, but lets your curls go free. A must do up-do for curly girls! This is by far one of my favorite way for curly girls to wear their hair!